Join us on the most exciting Treasure Hunt ever! Whether in Barcelona, Sitges, Gerona or Tarragona, you will have a terrific time! We initially designed them for companies as Team Building events, but they are also great fun for groups of friends, family celebrations, Hen or Stag parties, tourist tours etc.... Hunt for clues and discover the trail that leads to the final meeting point: on foot or by subway for more extensive hunts, as you wish. You will learn in an active and unconventional way while having fun, "competing" against other teams, or against yourselves. All the Treasure Hunts take about 2 hours and a half, except for the Gaudi Treasure Hunt that takes around 3 hours. Our treasure hunts are an excellent and exciting way to discover our most beautiful cities such as Barcelona, Sitges, Tarragona or Gerona. They are designed for groups from 6 – 300 pax. The groups are divided into teams of 6-10, roles are defined, objectives are clarified and commitments are made. Each team creates a name and a slogan for themselves and then the teams are given their first set of scavenger hunt clues. Each team also gets a “clue kit” backpack. These kits contain the essential ingredients needed by the team to break codes, figure out the clues and attain solutions. Clue kits contain digital cameras, different games and enigmas, scarves with your team colors and a Road Book with maps and explanations. The visit starts on the beautiful Plaza del Rey, in the Gothic Quarter. The treasure hunts itinerary is first around The Cathedral of Barcelona, Plaza Sant Jaume, the ancient Augustus Temple and the mythical Plaza Felip Neri, second station will be on the famous Ramblas and the Boquería Market, awarded as the most beautiful martket in the world. The teams will be guided by our team leaders who will be in charge of the games, missions and riddles. They will take care that nobody gets lost and will bring you through the most incredible sites, while telling you some of the culture and history of the places we visit. They are also in charge of the photo report of the whole event. Participants will receive secret missions to accomplish, and with the help of a Road Book and maps they will discover the most beautiful and hidden places of the Gothic Square. They will be given a camara and a back pack with the treasure hunt kit. For each mission or game well done, the participants will receive golden coins and only the richest team will be able to "buy" the final reward. 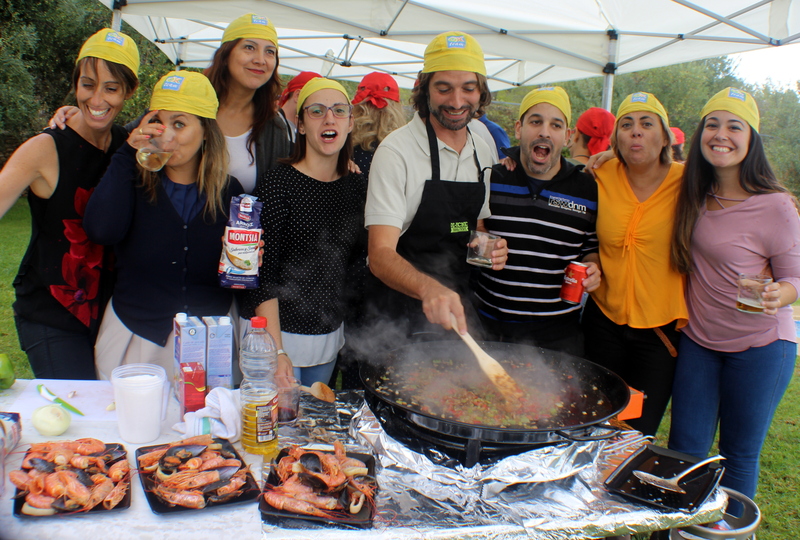 The Treasure Hunt can also be combined with a cooking contest: Instead of winning points or coins, the teams win ingrediants that will be necessary to cook their own lunch or dinner: a delicious paella which they will taste later on all together. This Treasure hunt takes longer: about 5 hours in total. It combines hunting and cooking. The cooking contest will be controlled by a professional cook, and the result is lots of fun. Check it out yourself! This Treasure hunt is a lot of fun and it envolves a lot of running. The teams have to find different places and take pictures as a proof, all in only a few minutes, because between one hunt and the other, we move up levels. On each level, we will have to complete funny games. If we win, we will gain some golden coins, but if we lose, we have to pay! This Treasure Hunt takes place along the port and the sea promenade of Barcelona. We will become Pirates, and we will travel from Spain (Columbus Monument) to America (Roy Liechtenstein POP ART sculpture). We will have to run and take pictures, play and compete against each other in funny games and win as many golden coins as possible, in order to win the Pirate Treasure. Why not choose the Dr. Clue CSI TREASURE HUNT? Find out about a mysterIous crime where teams have to hunt for clues in order to discover a murderer in Barcelona, Sitges, Tarragona or Gerona. The Treasure Hunt takes place on the same places as described before, but your team will not win any golden coins... They will become CSI detectives and will have to find a criminal, a crime weapon and a crime scene. Do you want to know more about it? Well, why not write us an Email? WE ALSO INVITE YOU TO TREASURE HUNT ON THE SEA ON A TRIP WITH OUR SAILBOAT "FLAMENCO"